RSS figures for November are now out, and also show a small fall on October, as did UAH. The 12-month running average still refuses to go above earlier years, despite the strongest El Nino conditions since 1998. Although temperatures are likely to rise still further in the next few months, there is absolutely no way this year will come close to approaching either 1998 or even 2010. I haven’t got time to worry about this. I share the aims of this website, and am always grateful for the work Paul does in exposing the lies, stupidity, numbers fiddling and other nonsense of those who would have us waste billions on trying, Canute-like, to hold back global warming or climate change (or whatever it’s called this week). However, living in Cockermouth as I do, I can assure you that the ludicrously named latest storm has done rather more than wet the gardens with a moderate breeze and a bit of rain. Not that the supposed record rainfall and the awful aftermath of the storm make me change my views. If anything, this demonstrates the futility of wasting billions in this country trying to reduce our CO2 emissions while the rest of the world largely continues to increase its CO2 emissions by a factor that dwarfs our efforts. Surely the moral to be drawn from these events is to stop wasting money trying in vain to prevent climate change, and to spend it instead on dealing with the effects of climate change. I don’t know whether the flood defences in Cumbria would have been more effective if more money had been spent on them, but spending money on flood defences looks to me like a better way to spend our money (together with a fund allowing a rapid response to events like these, e,g. to repair badly damaged roads). Perhaps Gavin forgot to adjust-out the UHI effect of ‘hot-air’ belched from 40,000 climate warriors in Paris? It didn’t show enough warming post 1998 and so they had to “upgrade” it. The Times reports that atmospheric CO2 data to be released soon will show a decrease, which would come about from a dominant oceanic flux that is reducing due to lower temperatures. It will be interesting to see how the AGW industry reacts to this potential Game Over data. Is that a fact , I’d love to see that data but surely Mauna Loa would reflect this ? Personally, I would believe the concentration figures, rather than the “theoretical” emission figures. They can’t possibly measure all of the emissions. But still, it will be interesting to see what happens if the theoretical emissions fall but the concentrations keep going up. Paywalled beyond a few paragraphs, BBC radio says a small increase in CO2 this year, is this an “adjustment” from a very inconvenient decrease? Sorry, my reply appeared in the wrong place. You’re talking about CO2 emissions, not CO2 concentrations in the atmosphere. Hopefully annual CO2 emissions will be leveling off soon (though they haven’t yet) and hopefully they will start plummeting shortly thereafter. But until emissions are a small fraction of what they are now, CO2 concentrations in the atmosphere will continue to rise. Oh dear! I fear the COLD that is surely coming with El Nina and Solar Cycle 24 . My old bones. Those are the two most critical issues to be determined. How does anyone measure a “global” temperature? Could it ever be possible? 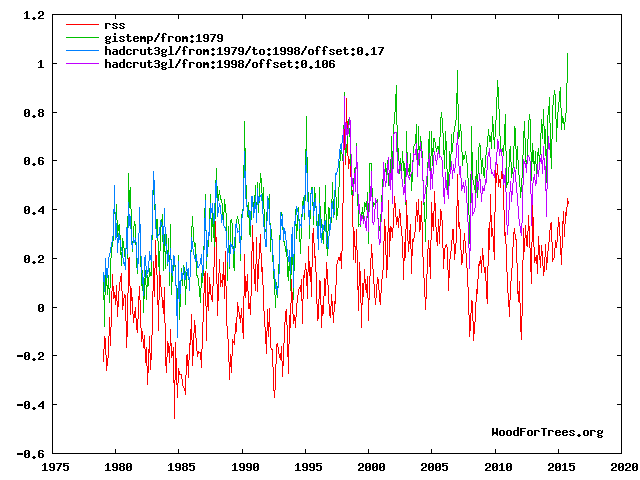 It is possible to measure global temperature using thermometers but not very precisely. There is a huge margin of error on even the best measures, which is rarely mentioned in the mainstream media. According to HatCrut4, the temperature at end of 2014 was somewhere between 0.493c and 0.773c above the 1961-90 average, taking the total error margins into account. At October 2015 it was somewhere between 0.676c and 0.951c. So in fact, taking error margins into account the anomaly could have gone up from 0.493c to 0.951c, or down from 0.773c to 0.676c, or anything in between. Of course if you created an equally spaced, regular grid of identical thermometers, across the entire globe, you could measure the temperature more precisely, with lower error margins. but there would always be errors. The same applies to all of the datasets other than HadCrut4. The fact is, all we can say is that the global temperature anomaly is somewhere between ???? and ???? and nothing more. There is a peer-reviewed paper on that topic here: http://dx.doi.org/10.1515/JNETDY.2007.001, and here for the full paper: http://www.uoguelph.ca/~rmckitri/research/globaltemp/GlobTemp.JNET.pdf. Considering the fraud squad, it is worth thinking how long it has taken to uncover Sep Blatter and his cronies. Everyone knew that the whole operation was corrupt but it took one of the least interested nations (the USA) to prove it. The IPCC / Climate lobby is a much more diffuse Big Brother than Sep was: not much chance of it being dismantled soon. Great blog! And really useful to see updated data. It doesn’t matter how much data you provide that argues against prevailing views about ‘climate change’, it’ll never convince proponents that they’re wrong. It’s because of the confirmation bias. Views that we all have are influenced by cognitive biases. The confirmation bias is one of these. This occurs when people focus on evidence that supports their beliefs or what they want or believe to be true, while ignoring evidence that challenges those beliefs. It would be good if your blog could invite some debate on how we can overcome this problem. It’s really important because a widespread belief in anthropogenic global warming is resulting in an incredible waste of taxpayers’ money being spent on trying to reduce production of CO2 instead of addressing real issues. I quite agree. Indeed I have said much the same thing myself for several years. The problem is, there are more sources than ever of CB, in the media, with every extreme weather event reported and none of the normal events. Also, people with no real knowledge of weather history are allowed to comment, confirming that any unusual event obviously being caused by “climate change” (without precisely defining what they mean by the term) and anyone with the opposing view not being allowed to express an opinion. However, until the panic subsides, and the weather patterns change, it will be very difficult to resist.